Skiffle is a music genre with jazz, blues, folk, and roots influences, usually using homemade or improvised instruments. This is the first book to explore this phenomenon in depth  a meticulously researched and joyous account that explains how skiffle sparked a revolution that shaped pop music as we have come to know it. Emerging from the trad-jazz clubs of the early ’50s, skiffle was adopted by kids who growing up during the dreary, post-war rationing years. Then, the pop culture was dominated by crooners and mediated by a stuffy BBC. Lonnie Donegan hit the charts in 1956 with a version of Rock Island Line’ and soon sales of guitars rocketed from 5,000 to 250,000 a year. 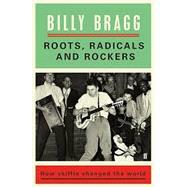 Stephen William "Billy" Bragg is an English singer-songwriter and left-wing activist. His music blends elements of folk music, punk rock and protest songs, with lyrics that mostly span political or romantic themes. Billy’s music is heavily centered on bringing about change and getting the younger generation involved in activist causes. For the entirety of Bragg's 30-year-plus recording career he has been involved with grassroots political movements, and this is often reflected in his lyrics. Bragg said in an interview: "I don't mind being labelled a political songwriter. The thing that troubles me is being dismissed as a political songwriter."